ICAA at Work is a recurring opportunity for ICAA members to interact with the New York region’s vibrant community of showrooms, workshops and studios. In a convivial social setting, participants can learn more about the host organization, see their work first-hand, and meet and speak with the people behind the works they create and purvey. Please join us on December 12 from 6:30 PM – 8:30 PM for a chance to explore the works of StudioEIS, including a showcase of finished and in-progress sculptural works as well as a glimpse into the careful process of creating true-to-life sculptural figures. Refreshments will be served. With design and production in subject areas ranging from history and anthropology, natural history and the physical sciences, to cultural, sports, social, and corporate history, StudioEIS’ projects can be found in museums throughout the country. 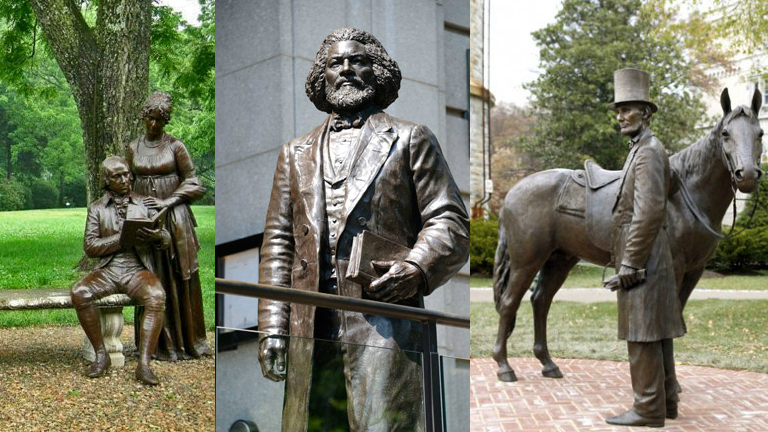 StudioEIS is well known for its Public Works in bronze, including sculptures of pop and sports icons and renowned individuals such as Thomas Jefferson, George Washington, Franklin & Eleanor Roosevelt, Frederick Douglass, and Abraham Lincoln. The studio has now produced more historical sculptures than any studio in the history of the United States, making this work part of our cultural history and the public record. The Studio has been the leader in the design and production of museum figures, with an increasingly varied range of projects being produced for Architects, Interior & Restaurant Designers, Corporations, and Retail & Entertainment clients worldwide. Please note that this event takes place at StudioEIS. The Studio can be most easily visited from Manhattan via the 36th Street Station. How do I register for an upcoming ICAA lecture or public program? To register for an event hosted by the ICAA National Office, you can use the registration link noted on the program page, email [email protected], or call 212-730-9646 x112. ICAA Chapters manage event registration for their own events. While Chapter events may be listed on classicist.org, you should check the Chapter website, or contact the Chapter directly, for the most up-to-date details including dates, times, pricing, and information on how to register. Do I need to be a member of the ICAA to attend a lecture or public program? Not all programs require membership to the ICAA. Details for each are noted on the program page; those that are not open to the general public should indicate that the event is open to ICAA members only. As many programs are free or reduced price for ICAA members, the ICAA does encourage you to sign up as a member if you are not currently. Is there a fee to register for lectures and public programs? The ICAA tries to keep programs free or at a reduced price for members. These details will be listed on the program page and registration page. The fee for non-members to attend programs hosted by the ICAA National Office is typically $30. Fees for Chapter events may vary. Note: If you are an employee of a firm that is an active member of the ICAA, you may be eligible to receive member benefits and to register at the member price. You are welcome to contact [email protected] or call 212-730-9646 x104 to confirm. The program I want to attend is sold out. How can I be added to a wait list? To be added to the wait list for an event hosted by the ICAA National Office, please email [email protected], or call 212-730-9646 x112. For any questions related to ICAA Chapter events, please check the Chapter website, or contact the Chapter directly for the most up-to-date details including dates, times, and pricing. I have an idea for a public program. Who should I contact? If you would like to suggest an idea for an ICAA event, please email [email protected] with a title, description, and short biography six to ten months in advance of the available time frame for consideration. Note that the ICAA is able to offer a limited number of programs each season. If you would like to lecture for one of the ICAA's regional Chapters, please contact the Chapter directly. I am a member, and would like to register a guest for the event. How do I do this? If your membership level permits you to invite guests, please reach out to [email protected] or call 212-730-9646 x112 to share your guest's name with us. Or, you may register your guest online and then reach out to confirm that they are attending as your guest. If you would like to confirm how many guests your membership allows, please contact [email protected] or call 212-730-9646 x104.